First Niagara Pavilion (formerly known as the Post-Gazette Pavilion), an outdoor concert venue located in Burgettstown, PA, about 25 miles west of Pittsburgh, was opened back in 1990 and has been the destination for major contemporary bands and artists who come through the Pittsburgh area on summer concert tours each year. Over the years, bands and artists that have played the venue include the following: Dave Matthews Band a total of 15 times; The Allman Brothers Band a total of six times; Tom Petty and the Heartbreakers; The Beach Boys; Jimmy Buffett; KISS; Toby Keith; John Mayer; Aerosmith; Korn and Rush. This summer, the following musical acts will come through Pittsburgh and play the venue: Tim McGraw on May 18; Dave Matthews Band yet again on May 31; Pitbull and Kesha on June 2; Big Time Rush and Victoria Justice on July 14; Jimmy Buffett on July 18; Blake Shelton on August 2; Maroon 5 on August 6 and John Mayer on August 25. Tickets for all concerts at the First Niagara Pavilion this summer can be found right here at SeatGeek. 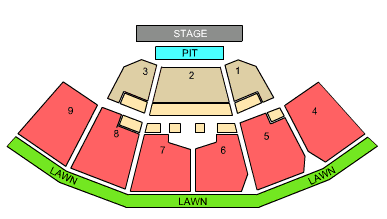 For a look at the seating chart for concerts at First Niagara Pavilion, check out the image below. The venue seats 23,000.